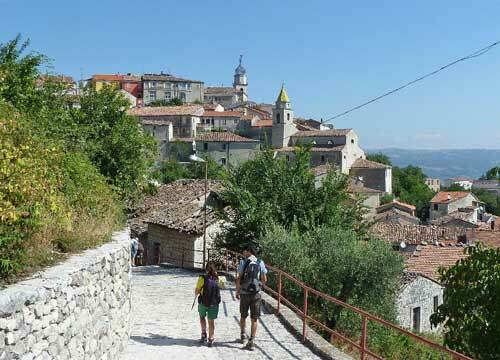 Sepino is a town of 2,069 inhabitants in the province of Campobasso. 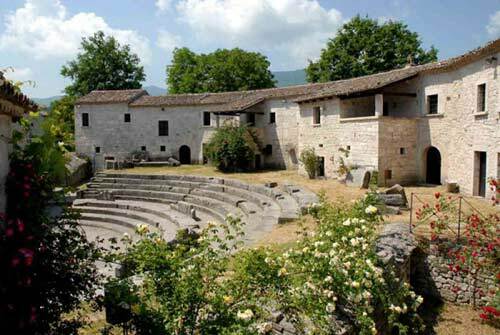 The town of Sepino lies on the plain at the foot of the Matese, facing towards the Tammaro Valley, it is part of the circuit of the most beautiful villages in Italy. 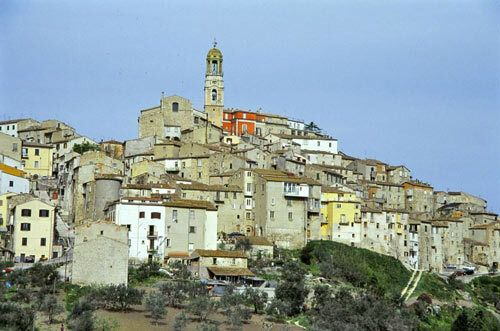 The town of Sepino keeps the typical medieval features. 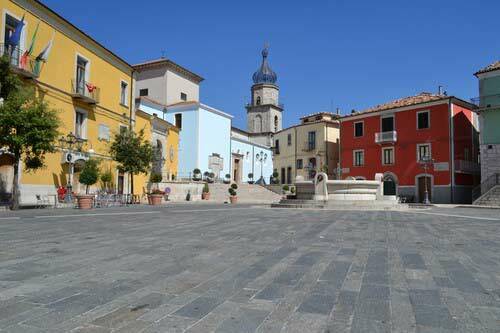 A large square that matchs a number of narrow alleys. There are numerous fountains, such as the one placed in the main square, with its taps indicating the cardinal points, or those of Canala and Masacherone. 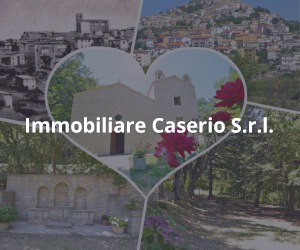 Campitello di Sepino is a very interesting place, where you can appreciate large green areas in a large wooded area, predominantly beech. 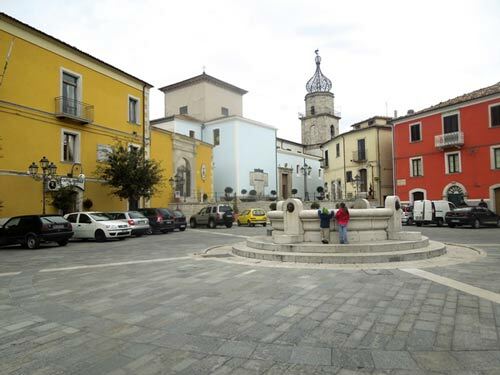 From this plateau you can reach the tops of the surrounding mountains, inhabited in the past by bandits, Passo Santa Crocella, where there was the namesake Benedictine monastery in the Middle Ages, the Fountain of Rimavota and other destinations on the Matese mountains. Among the most important rivers, rich in fish such as trout, particular attention has to give to Tammaro, which takes its name from the homonymous valley, and Tappone that, along a very steep way, gives life to the Chestnut waterfall. 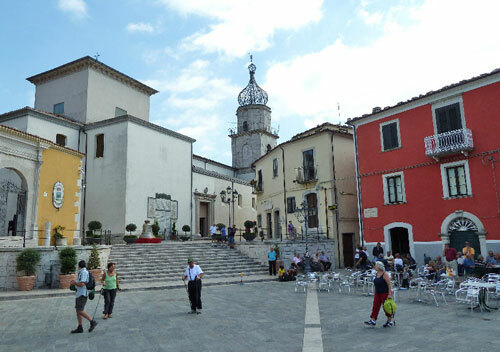 Near the town is the Baths of Tre Fontane, whose waters have characteristics suitable for trace elements to the care of kidney. 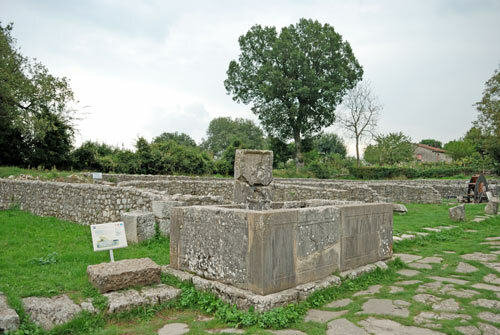 The Roman city is preceded by a period of Samnite fortified center which is located on the back mountain, called “Terravecchia,” conquered by the Romans in 293 BC, during the third Samnite war, and thereupon abandoned by the population that moves downstream. The town walls, built in opus (quasi) reticulatum, using limestone from the Matese, are 1270 m in length and enclose a quadrangular area of almost 12 hectares. 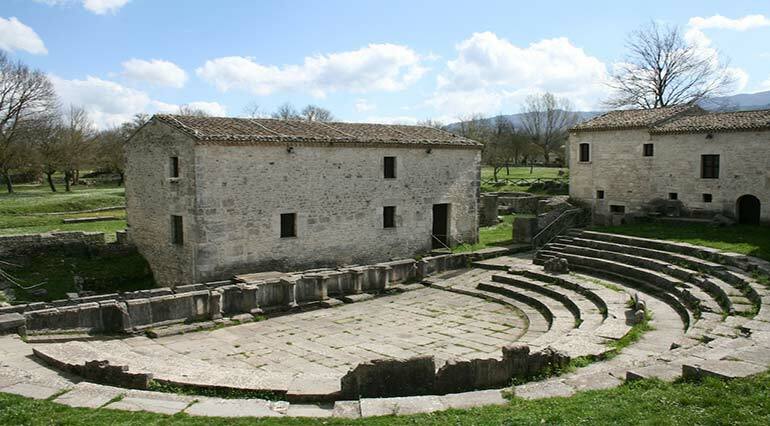 The theatre, dating to the first half of the 1st century A.D., is built in opus caementicium and is characterised by its horseshoe-shaped orchestra. The auditorium is divided horizontally into three parts, and vertically into several sectors by ramps of stairs. These stairs provided for the entrance and exit of the spectators. 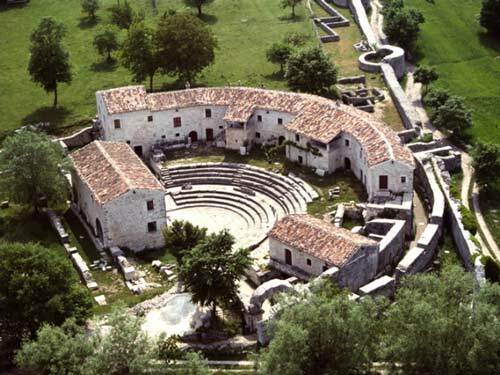 The theatre was crowned by a circular sacellum (small cult building) of which a few curvilinear blocks are still in situ. 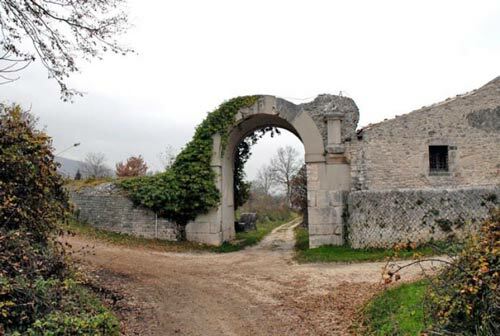 The entrance and exit of the spectators was facilitated by a postern gate that opened in the town walls, allowing visitors to enter directly into the theatre from outside the town, thus guaranteeing that the crowd could move in safety. 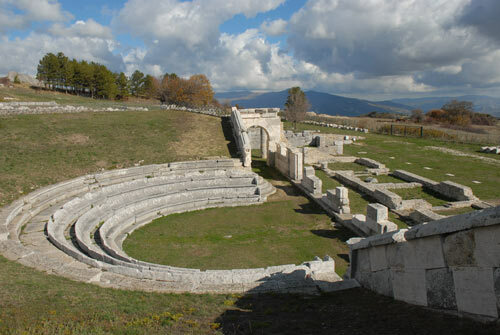 The “arena-pool-portico” complex was planned at the same time as the theatre and comprised a central space which was used for exercises and gladiatorial games, at the centre of which was a swimming pool; a U-shaped portico that provided shelter for the theatre audience during the intervals or in the event of bad weather and a garden which was, in the late imperial period, embellished with a fountain made from reused building materials. There is also a museum. 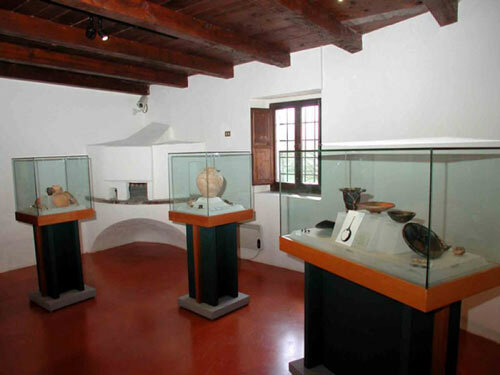 It has a huge collection consists of the artefacts found in the resort and in the necropolis; the majority date from the imperial period. The exhibition follows a chronological order. 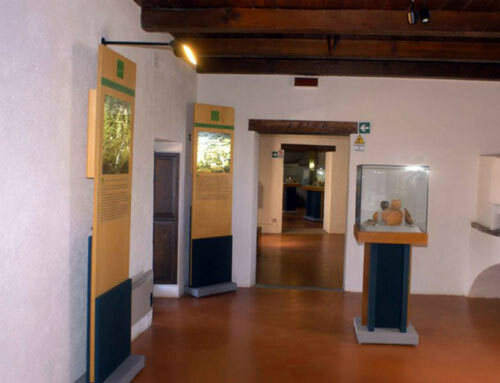 The exhibits illustrating the life and activities of the area, such as tiles, compasses and work objects, or nuts and a little doll to play, and also brooches and pins between personal accessories. 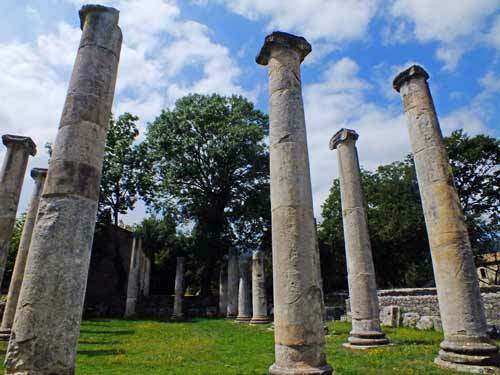 The basilica has a rectangular plan with an internal peristyle of twenty columns, all smooth trunked and topped by Ionic capitals and supporting an upper level. The macellum or indoor market had an entrance raised above street level, to which it was linked via a pedestrian walkway, and had a threshold formed by a small paved area. 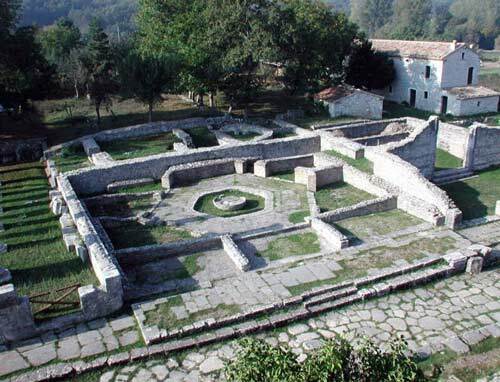 This structure has a trapezoidal plan and a hexagonal central hall, paved with irregular limestone tesserae. 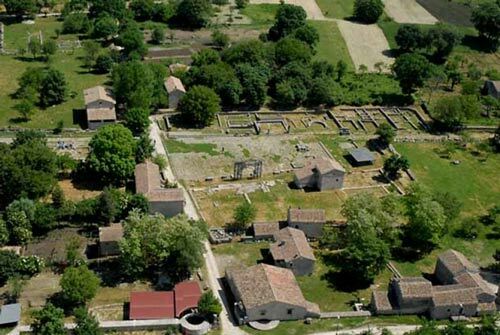 The rectangular or trapezoidal spaces arranged around the sides are shops. 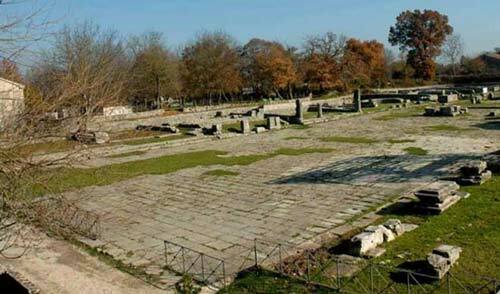 An important building, dated to the beginning of the 2nd century A.D., is located on the south-western side of the forum. 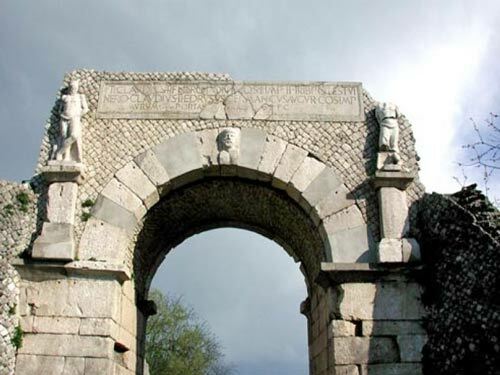 An arch stood in front of this building, of which the bases of the piers have survived in situ, bearing an inscription to L. Neratius Priscus who financed this entire construction. 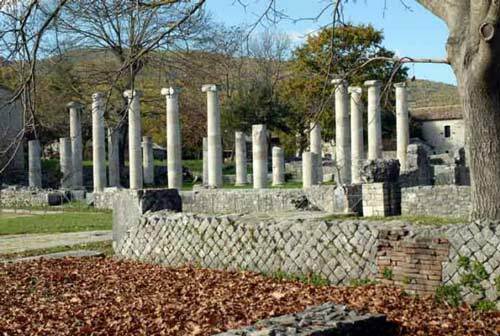 This building is followed by a series of structures of Augustan date, municipal buildings, sacellae or guild premises and a square fountain. The fountain of the Griffin, dated to between the 2nd century B.C. 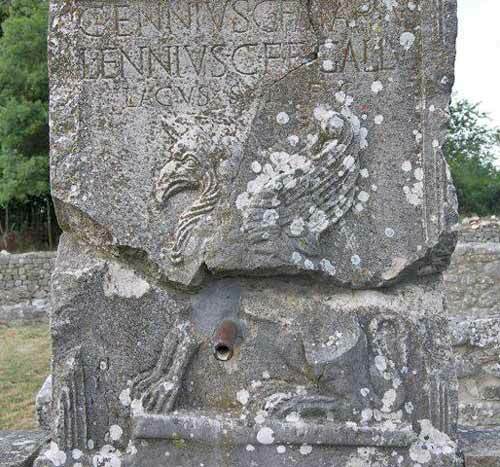 and the 4th century A.D., is decorated with a relief a griffin shown in profile, squatting on its hind legs.